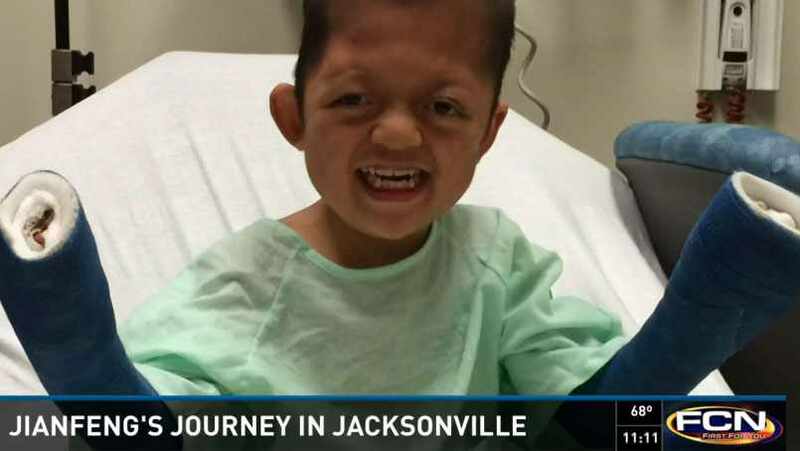 Jianfeng's journey and medical care were featured in a story earlier this month on Jacksonville's First Coast News. 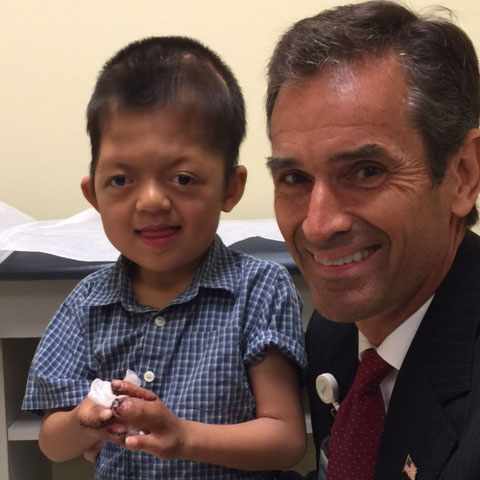 Shelley and Kenneth DeVault, M.D., have been thinking about Jianfeng, a five-year-old boy from China with Apert syndrome, since the day he was born. Abandoned at an orphanage because of the facial and hand deformities caused by his condition, Jianfeng was placed into the care of Grace & Hope for Children, an organization that helps get orphaned children in China into foster homes throughout the country. "My wife has worked as a volunteer for Grace & Hope for Children for 10 years," Dr. DeVault, a Mayo gastroenterologist, tells us. "She's known Jianfeng since he was born, and had talked about him and what we could do to help him consistently over that time." When it became clear how much Jianfeng's condition was affecting his quality of life, those words turned into action. "Children were making so much fun of him at school that he couldn't go to school," he says. "So Shelley talked to me about him again, and sent me some pictures and descriptions." Her timing couldn't have been better. Dr. DeVault was at a leadership meeting with the chair of Plastic Surgery, and the two talked about whether and how they could help. That conversation sparked a community-wide effort to give Jianfeng the medical care he needed to live a more normal life. "Since we're not a pediatric center here, it was very much a multi-hospital and multi-specialty effort," Dr. DeVault tells us. "There were physicians from the Baptist Hospital system here in Jacksonville, the University of Florida, and several private practice friends of ours who all came together to help Jianfeng." Jianfeng with Dr. Peter Murray. As Jacksonville's First Coast News reports, it began with pediatric surgeons at the University of Florida, who fixed the skull plates that had fused together due to Jianfeng's condition. Then, Peter Murray, M.D., an orthopedic surgeon at Mayo Clinic's Florida campus, separated Jianfeng's fingers. Though the surgery required a great deal of delicacy and precision to correct five years of deformed growth, Dr. Murray tells us the most interesting part for him was seeing Jianfeng's reaction once his casts came off. "When he saw them separated for the first time, it caused him quite a bit of anxiety," he says. "But he quickly adjusted to it." And while there were times when his care team felt their own anxiety, Dr. DeVault tells us that Jianfeng now has all he needs to live a normal, happy life. Including a family in Washington state who's adopting him. "Jianfeng's a very bright kid, and I always felt he was going to be OK from a cognitive perspective," Dr. DeVault says. Having a family adopt him will likely change his life the most, he says, but even short of that, the changes Jianfeng has seen as a result of his medical care “would have made a big difference for him." You can see more of Jianfeng's story here. Then be sure to share your comments below, and use the tools atop this page to share this story with others.